IBPS SO Exam Analysis 2019: Institute of Banking Personnel Selection conducted the IBPS SO Mains on 27th January 2019 while the prelims was conducted on 29th & 30th December 2018 across the country. IBPS SO exam is conducted to select candidates for the posts of IT Officer, HR, Agricultural Officer, Law Officer, Marketing Officer, and Rajbhasha Adhikari. As per the feedback of the candidates, the exam was found to be a bit complex. Quantitative Aptitude and Reasoning Ability was time-consuming since it required candidates to solve complicated questions. English Section was of a moderate level. Now that the IBPS SO Prelims and IBSE SO Mains has been conducted. Those candidates who are preparing for the IBSE SO Exam 2019-20 can refer this detailed IBSE SO Exam analysis. 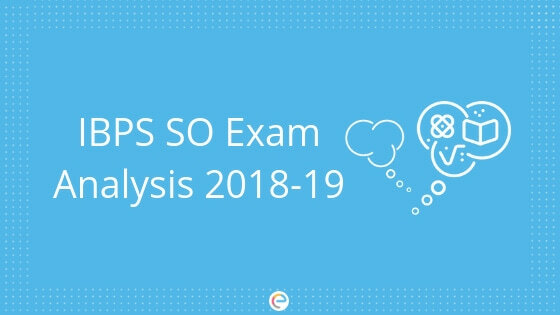 You can go through this article on IBPS SO Exam Analysis and understand the type of questions asked in the exam, the important topics, the frequency of questions and the difficulty level of each section. There will be negative marking too. For every wrong answer, 1/4th of the marks or 0.25 marks will be deducted. So it’s better to leave the question if you are not sure about its answer. The first exam of IBPS SO Prelims was conducted on 29th December 2018. The exam on this day was held for IT, MKT, AFO, HR, Law and Rajbhasha Adhikari. Note that this analysis has been prepared as per the feedback from the candidates. Here we have tabulated the IBPS SO Exam Analysis for the exam conducted on 29th December 2018. IBPS SO Prelims on 30th December 2018 was conducted in two shifts. This exam was conducted for the Specialist Officers. Here we have tabulated the IBPS SO Exam Analysis for shift 1. Most of the questions were from Banking Awareness and Current Affairs from the month of October to December. Now that you have got the IBPS SO Exam Analysis 2018, we hope you do not face any issue preparing for the IBPS SO mains that is going to be conducted on 27th January 2019. Along with the exam analysis, we suggest you take IBPS PO Mock Test. This test almost has the same sections as that of IBPS SO. Taking mock test does not only help you in practising for the exam in a better way but also boost your confidence level and improves your time management as well. If you have any doubt regarding the IBPS SO Exam Analysis or with the exam in general, then do drop down queries in the comments section below and we will get back to you soon.